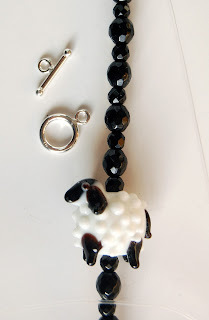 In my previous blog post I described how I came to make a pair of sheep earrings for a friend of mine to give as a gift. The byproduct of this process was a sheep bracelet mock up that sat on my bench for a couple of weeks before I decided what to do with it. Between the holidays and running the Happy Holidays Pop-Up Market, I did not have time to put away unused supplies from the few pieces I managed to create during December. that would be opposite the clasp in a finished bracelet. It would have taken a similar amount of time to disassemble and properly stow the parts as it would to complete the bracelet so I decided to finish it up. 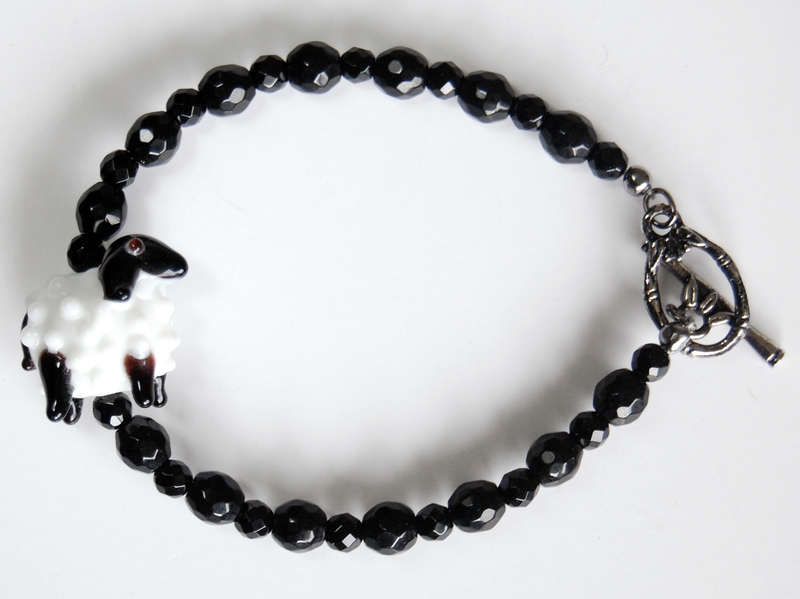 The mock up anticipated a sterling silver toggle clasp and findings to finish off the bracelet. Since I was no longer constrained by the request for sterling findings, I could now consider other options. With the beads being mostly black and white, I thought gunmetal would be the perfect color for the crimp bead covers, jump rings and toggle clasp. Now that I had a plan, I gathered up some beading wire, crimp beads and gunmetal tone findings and set about to turn my design into a finished bracelet. I liked it so much I listed it in my EDCCollective Etsy shop.